The Duchess of Cambridge has carried out her second, solo overseas visit with a series of engagements in Luxembourg. Kate headed to the Grand Duchy on May 11th where she was welcomed by the country's royals. There was cycling, there was history, there was a spot of culture - here's a look back at Kate's Luxembourg Photo Album. The day began with a visit to the Grand Duke Jean Museum of Modern Art where there were posies for the royal visitor and a chance to look around the installations. After the art, it was time for exercise. Luxembourg is hosting the first stage of this year's Tour de France and the Duchess of Cambridge popped into an event all about cycling. Kate also unveiled murals of British and Luxembourg Tour legends by James Straffon. 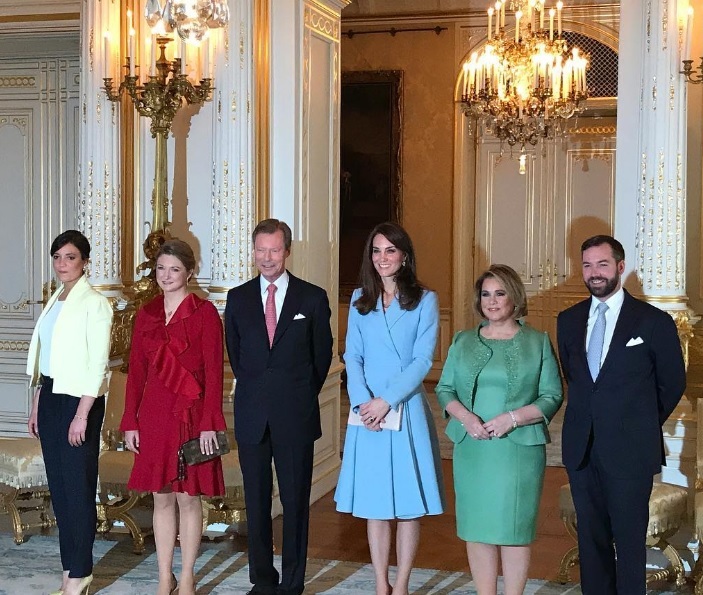 The Grand Duke and Duchess of Luxembourg, Henri and Maria Teresa, welcomed the Duchess of Cambridge to their home where they all posed for photos with Hereditary Grand Duke Guillaume, Hereditary Grand Duchess Stephanie and Princess Alexandra. Kate was in Luxembourg to attend events linked to the 150th commemoration of the 1867 Treaty of London. Alongside Guillaume and Stephanie she visited the Luxembourg City Museum for commemorations. The three also went to the Drai Eechelen Museum where Kate got a chance to see original copies of the Treaty. No royal visit is complete without a walkabout and Kate had a chance to see the sights as her visit came to an end. The Duchess of Cambridge in Luxembourg, May 11th 2017.